« Wait, did you say “Flamethrower”? Remember when we teased you with a stack of RX-64 servos? Well its time to unveil a bit more of what we’re working on for the upcoming Mech Warfare competition at Robogames 2009. 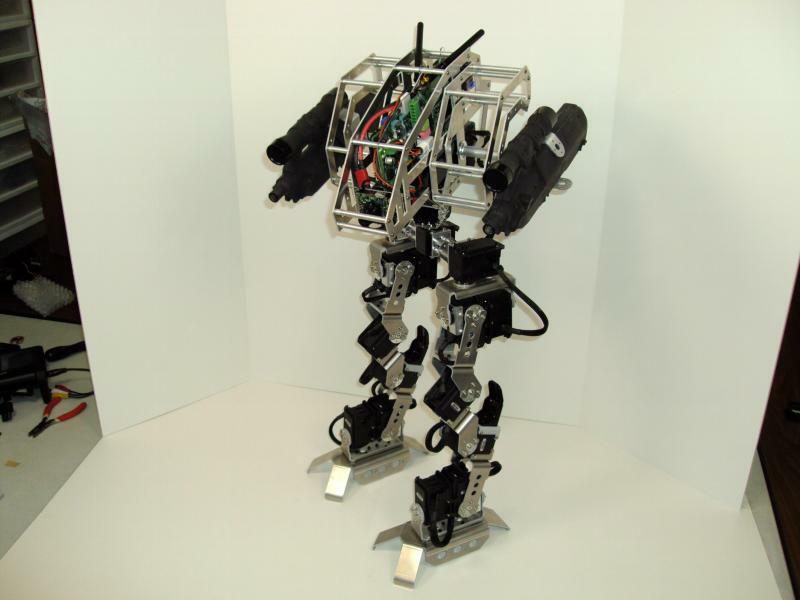 Meet Hagetaka; a 7DOF per leg biped built around the powerful RX-64 servo from Robotis. This robot boasts 14 RX-64s, 2 RX-28s, a custom aluminum chassis machined by sponsor Big Blue Saw, an onboard linux based Gumstix computer with a PS3 Sixaxis controller , a WiFi video server using a Headplay Personal Cinema System for remote piloting, and of course dual automatic airsoft guns. Video and more info will be available in the near future, and be sure to check out the June issue of SERVO magazine for the first in a series of articles detailing the build process of this Mech. This entry was posted on Thursday, April 16th, 2009 at 2:59 pm	and is filed under Featured Projects / Robots, Mech Warfare, News / Articles. You can follow any responses to this entry through the RSS 2.0 feed. You can leave a response, or trackback from your own site. You has GOTS to put a small GI Joe or some such in the cockpit. That is some sweet electromechanical work! Wow that is cool, you could probably sell kits for that, it would be cool to have one. How much has the build set you back so far? Total retail parts cost is a bit over $10,000 USD… but that’s not factoring in the hundreds of hours I’ve dropped into it over the past 6 months. 2) use SPI-rs485 converter chip but that is more hardware hacking than i’d like to get into. Any suggestions/comments would be greatly appreciated.